Robert McGown Coventry A.R.S.A., R.S.W. The Collection of the Late Harold Shaw, U.S.A.
Coventry was born in Glasgow and trained initially as a designer, but changed course to study at the Glasgow School of Art under Robert Greenlees (1824-1894), who was head of the School until 1881. He subsequently furthered his training in Paris under Bougereau and Fleury before returning to Glasgow. He travelled widely in his lifetime visiting France, Holland and Belgium frequently and making a trip to the Middle-East in the 1890’s. But he always returned to Glasgow, showing a substantial body of work at the (Royal) Glasgow Institute of the Fine Arts and at the (Royal) Scottish Society of Watercolour Painters. He showed at the Royal Scottish Academy regularly from 1875 until 1926, becoming an associate member in 1906. He became a full member at the RSW in 1889. His daughter Gertrude Mary Coventry also became a professional painter. Like so many of his generation, Coventry was attracted by the French interest in plein-air painting and the majority of his work throughout his life has a loose free-brushed style to it. His watercolours at times go further and show that particularly Scottish ‘blobbing’ technique in watercolour advanced by Arthur Melville, James Paterson and others and known as the ‘blot-esque’ method. 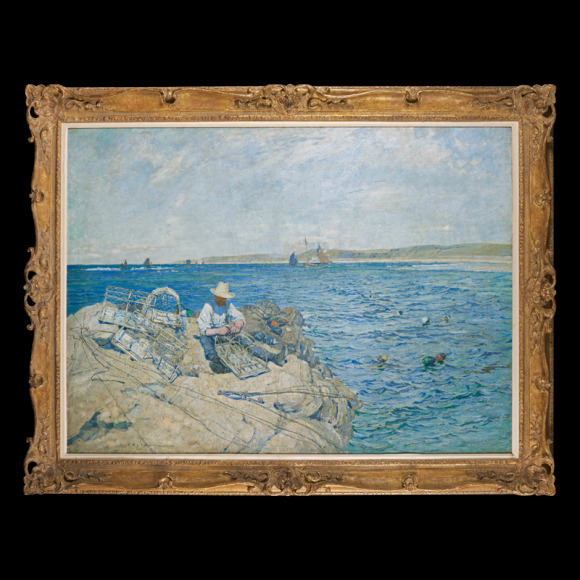 A Lobster Fisher though is a work that shows Coventry at a stage in his career where his influences would have been the French plein-air painters known as the ‘Salon Naturalists’. These painters developed a kind of ‘semi-impressionism’ whereby they produced loose, free effects in the backgrounds of their paintings, but whose foregrounds and figures were distinctly realistic. The internationally accepted leader of this group was the short-lived but highly gifted French artist Jules Bastien-Lepage (1848-1884), whose prime subject matter became the peasants and field-workers around his native Damvillers in France. His work could be said to be a combination of the plein-air concerns of the Impressionists and the realism of Millet or Courbet. His pictures were received with considerable enthusiasm in Scotland resulting in the public purchases of his Pauvre Fauvette for Kelvingrove Art Gallery in Glasgow and his Pas Meche National Gallery of Scotland. 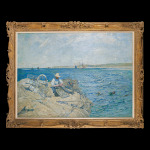 The group of Scottish painters known now as ‘The Glasgow Boys’ began to produce paintings in the early 1880’s showing a decided ‘Bastien’ influence and it is among the early works of ‘Boys’ like James Guthrie, Edward Walton and John Lavery that Robert Coventry would have produced this present painting. A Lobster Fisher is probably the masterpiece of Coventry’s early career. Substantial in size (the canvas is 5 foot long) it is a depiction of fisherman seated on a rocky shoreline mending his creels. It must be the so titled picture that he exhibited in Glasgow and Edinburgh in 1891 and 1892. At the Glasgow show the asking price was £180, which was considerably more than his usual prices. This must indicate a picture of substantial size and quality. 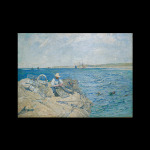 Indeed it was to be 1908 before he was recorded as asking more than that for a painting. We can also assume that this is the East Coast of Scotland, where Coventry is known to have spent a good deal of his time in search of subject matter amongst the fishing villages. Here the artist would have notice the similarities of the bright east coast light to the brighter skies and suns that he would have been painting in France and he sets about delivering his picture in a pleasingly bright, high-key tone. 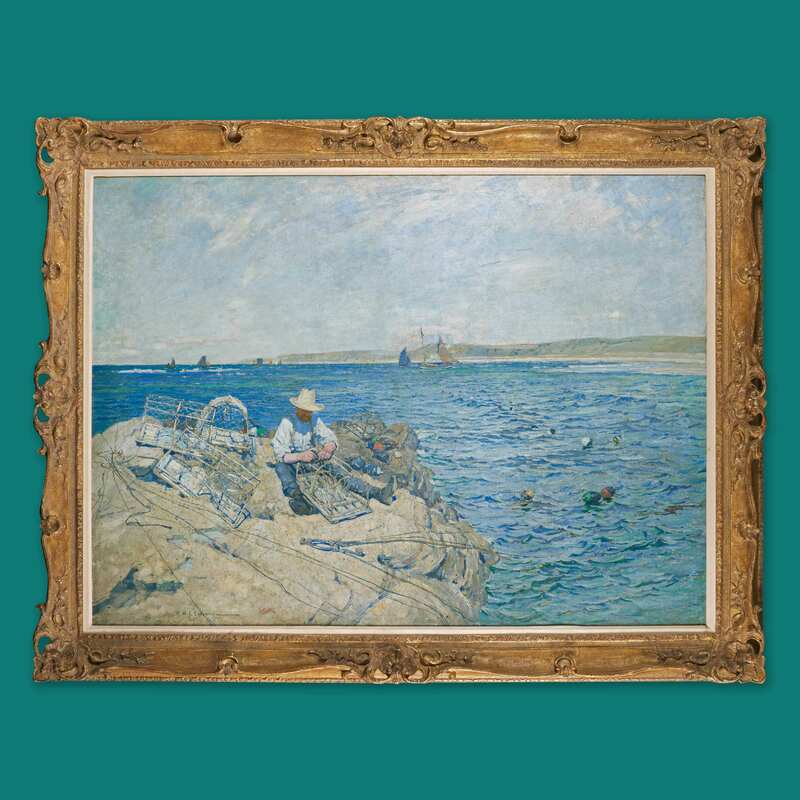 His figure of the fisherman is exceptional and belongs squarely among the fieldworkers and fishermen depicted by Bastien Lepage or the Glasgow Boys. 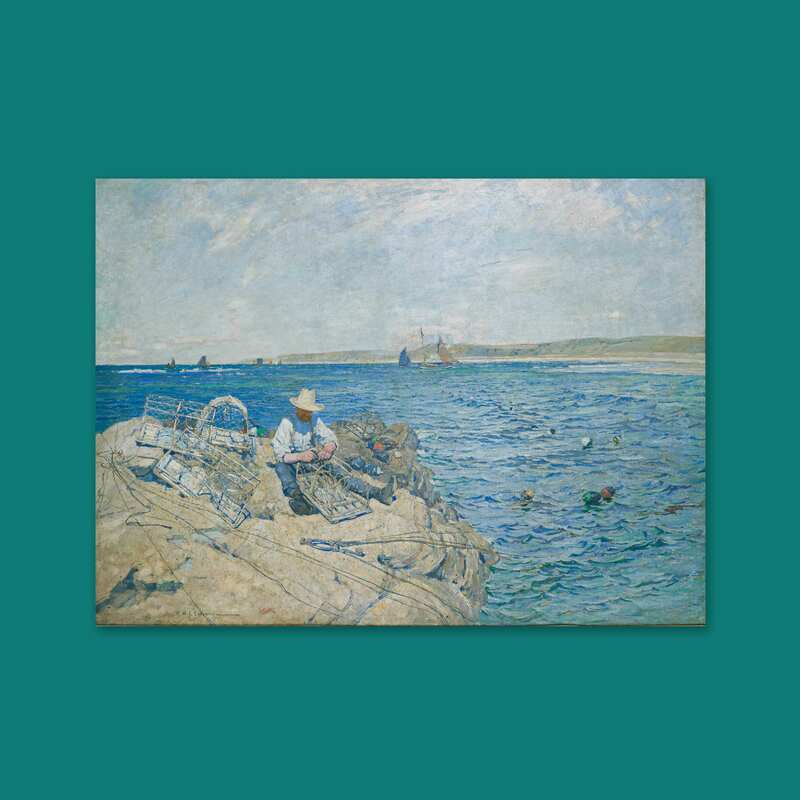 The figure is boldly painted with strong geometric brush-strokes and with his coastal setting and light-coloured straw hat reminds us also of that other celebrated group of Bastien followers, the Newlyn School of painters. Coventry would develop a career as a pleasingly loose and free painter of rural and coastal scenes, which depict the effects of the Scottish weather with considerable skill. But in A Lobster Fisher he shows himself also to have been among the first Scots to respond to the Naturalism of Bastien-Lepage. In terms of the scene we are shown this is a beautiful depiction of a Scottish bay in bright sunlight. But it must also be seen as a major work from a young Scottish artist, fully immersed in the new Naturalism, as this avant-garde French style of painting began to find its way into the British School.